Catholics demonstrate their devotion to Mary, represented here, in the rosary. 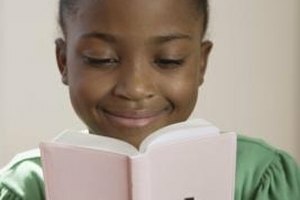 Catholics believe in an active prayer life. Worshipers pray during Mass, at home and in groups. 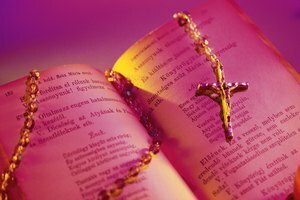 The rosary retains a special position in the canon of prayers. Ordinary Catholics created this unique prayer ritual. Moreover, the rosary is a devotional to Mary, a woman who became holy, according to Catholic tradition, through her obedience to God. The rosary is a set of prayers in which Catholics focus on the life of their savior, Jesus. Laypersons, church members without any officially sanctioned positions, created the rosary during the 2nd century. The goal of these Catholics was to create a ritual prayer similar to those of monks. Christian monks, and others living in religious orders, spend each day praying. Monks, for example, often pray the lengthy Divine Office. Reciting these 150 scriptures consumes a large portion of the day. Unable to allocate so much time to prayer, regular Catholics developed a condensed version. 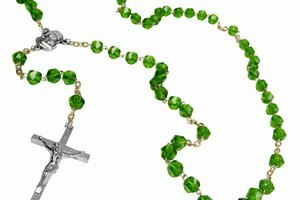 Because most 2nd century Christians were illiterate, the rosary consists of prayers they would have committed to memory. Despite changes over the centuries, this same principle of simplicity still applies. The rosary opens with the “Apostles' Creed,” which Catholics recite, to a degree, almost every Sunday. Next on the list is the “Our Father,” also known as the Lord’s Prayer, that Catholics incorporate into every Mass. The "Hail Mary,” which honors the mother of Jesus, comes next. Last, is the “Glory be to the Father,” a short declaration mentioning the three entities, Father, Son and Holy Spirit, that Catholics believe represent God. The repetitious nature of the rosary resembles the quiet chanting performed by monks. 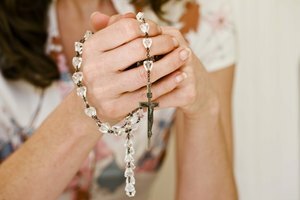 Catholics use the rosary as a means to contemplate, or reflect upon, Christian life. This form of contemplation comes recommended by the Vatican as one of the major forms of Christian prayer. The rosary is also significant because its words emphasize the life of Mary. Known as a Marian Prayer, the rosary demonstrates devotion to the mother of Jesus. 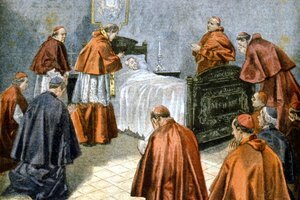 Is a Rosary Expected at a Funeral? Kenneth, David. "The Significance of the Rosary Ceremony." Synonym, https://classroom.synonym.com/significance-rosary-ceremony-5286.html. Accessed 25 April 2019.